Part A consists of a thick colored paste consisting of epoxy resin, graded aggregates, pigments and additives. Part B consists of a soft paste consisting of a mixture of graded fillers and catalyst. Primary Uses : For grouting residential and industrial floor joints where hygiene control, damp & wet conditions are experienced along with chemical resistant properties. Typical Applications : Perma R - Poxy is designed for use in floor tile, wall tile and stone joints for interior as a jointing material and exterior application for joints width varying between 2 mm to 15 mm. The area of application are for floor and wall tiles in bathroom and shower areas, kitchen counter tops, terrace and balconies, chemical plant, hospitals, refineries, garages, laboratories, warehouses, bakeries, swimming pools etc. 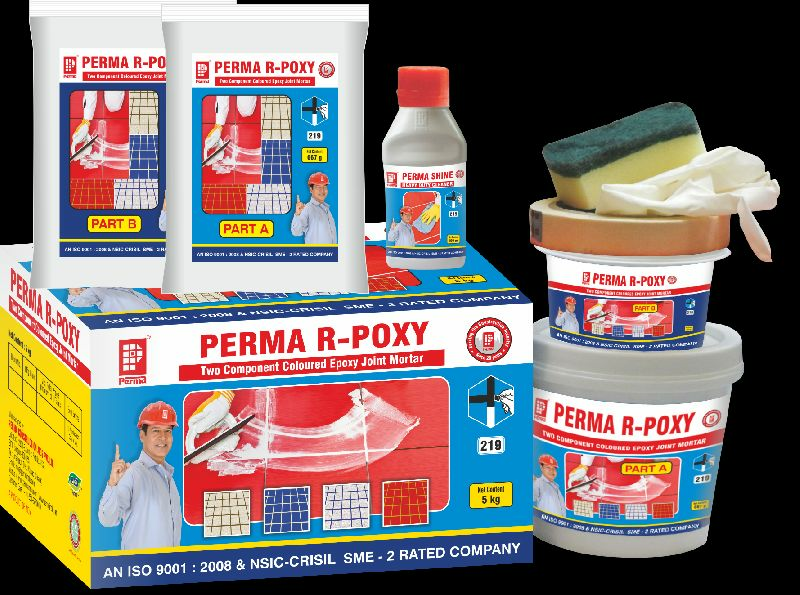 Packing : Perma R - Poxy is supplied in 1 kg and 5 kg pack size. Mixing Ratio : Mix Part A two parts by weight to Part B one part by weight with the help of a slow speed drill equipment to a lump free homogeneous consistency. Spread the material with a spatula or squeeze float into the joints. Preparation of the area : Make sure that the tiles or the stone joint operation is taken up atleast 72 hrs after the tiles are laid. The joints shall be dry and free from deleterious materials. Application : Apply masking tape where porosity in tiles or stones is encountered. If not, clean the joints with a blower and apply the grout gel using a squeezy blade. Clean the grouted area with a squeezy sponge dipped in water and finishes the surface. Allow the grout to dry through air curing.